Northwest Van Campers Guest Photo – Miller’s Landing, Alaska. Miller’s Landing Alaska, on Resurrection Bay in Lowell Point near Seward, is a place to find campgrounds, fishing, and panoramic beauty. 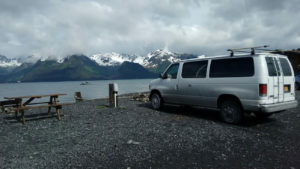 Here’s a picture of the van in action at Miller’s Landing, taken by a couple of our happy Van Campers Lisa and Judy. If you’re looking for other destination ideas, check out our Destinations to take a Camper Van in Alaska!